If you can’t tell by their name, Fundanoodle has fun lessons to work your little one’s noodle, or… brain! 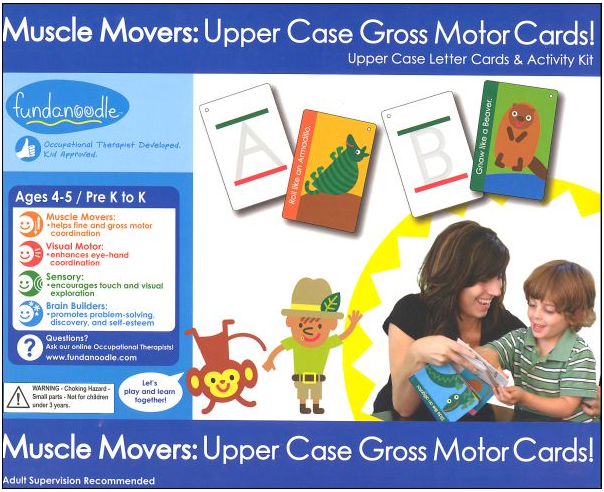 Fundanoodle is a complete handwriting program developed by pediatric occupational therapists Michelle Yoder and Amy Bumgarner. The program uses fun and engaging skill-building activities and exercises to help kids ages three to six develop and improve the foundation they need for writing and other everyday tasks. Fundanoodle’s colorful writing and multi-activity kits take kids on a fun-filled journey as they master essential skills like gross and fine motor skills, hand-eye coordination, memory and concentration, and more. They also have great Fundanoodle’s mascots Max and Alphie that keep your kids having fun through each lesson. This program uses action terms like “zip across” and “hop to the top” to teach kids proper lower and upper case letter formation. Red and green (stop and go) ruled lines provide visual cues for practicing letters and numbers. I love that these products are designed to work for children with different abilities, strengths and weaknesses. The products can be purchased individually to target specific skill or in all-inclusive kits that address a wide range of skills. All of the products were a lot of fun, but I really love the MagnaStix: I can build Lower Case Letters. My youngest can use all of the colorful magnastix to make the correct letters on the board. Fundanoodle also has a FREE iPad/iPhone App. For FREE you will receive 4 letters and 4 numbers. For $1.99 you can download the remaining letters and numbers. The app follows the same language and system as the books, but you can also do it with technology! One Southern Savers reader will win products from Fundanoodle based on your child’s age. 1. Comment: Leave a comment below telling me which Fundanoodle Learning System your little one will love to learn with. 3. Follow: Fundanoodle and Southern Savers on FACEBOOK, or DAILY EMAIL and leave a comment below that you are. This giveaway is sponsored by Fundanoodle. I received products to review, but all opinions above are 100% my own.